What is brand precision marketing and why should you be using it? 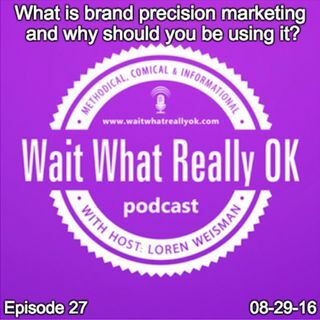 Wait What Really OK Podcast Episode 27 hosted by Brand Precision Marketing Strategist and Counselor, Loren Weisman, works to define the concept and details of Brand Precision Marketing or BPM. The main focal point is to create a brand correctly that is enhanced and aligned with its content which in turn allows for the easiest and most affordable marketing. When the foundation is in place, the brand, its content ... Más informaciones and the marketing of that content work in a much more effective trifecta that can yield better engagement and better conversions. Taking the time to create each piece in the right order from the logo to tagline, the one liner to the short bio, the call to action to he editorial calendar, the clarity, uniformity and continuity makes for a more precise execution of marketing, advertising, content creation and distribution. This weeks show is sponsored by the letter L, the number 12 and the color purple. What is brand precision marketing and why should you be using it? Ep27 of the Wait What Really Ok Podcast is available on iHeartRadio or on Spreaker. Podcast Blog Supplement for Episode 27 of the Wait What Really OK Podcast with Loren Weisman. Podcast Link Supplement for Episode 27 of the Wait What Really OK Podcast with Loren Weisman. Branding and uniformity makes customers more comfortable. Podcast Video Supplement for Episode 27 of the Wait What Really OK Podcast with Loren Weisman. Podcast Photo Supplement for Episode 27 of the Wait What Really OK Podcast with Loren Weisman.